ALCOHOL IS THE MOST COMMONLY USED ADDICTIVE SUBSTANCE IN THE UNITED STATES, according to the National Council on Alcoholism and Drug Dependence. One in every 12 adults, 17.6 million people, suffer from alcohol abuse or dependence. Several million more engage in risky, binge drinking patterns that could lead to alcohol problems. Looking into the reasons individuals become addicted to alcohol is why Dr. Mark Fillmore came to the University of Kentucky from Canada 17 years ago. Fillmore’s research is a combination of psychology, behavioral neuroscience, biology and pharmacology. Looking at the differing ways individuals react to drugs of abuse, whether the drug be alcohol, marijuana, or some other drug of abuse, may give insight into why some people become dependent on a drug over time. Utilizing state-of-the-art eye tracking technology, Fillmore and the graduate and undergraduate students working in his lab are able to track how much time individuals look at alcohol or drug-related images or ads. There are two devices: the first is a monitor that the subject looks at while it tracks eye movements as various images rotate on the screen; the second is a mobile device the subject wears to track eye movements while looking and walking around a room. “One of the phenomena we have noted in addiction is that addicts or individuals who are developing substance abuse problems have a heightened attention or attraction to the visual cues for the drug. They look at liquor ads in a magazine longer; they look at a billboard that shows a brand of alcohol; or they look at a bar as they are driving down the road,” Fillmore explained. As the subjects walk around a room, the technology tracks their eye movements and records the time spent looking at objects. “This measure is called the fixation time and individuals who have a greater risk for developing alcohol abuse will look at and be drawn to these visual cues more than someone who is a moderate drinker,” Fillmore said. Fillmore’s lab also utilizes an advanced driving simulator that can be programmed with a myriad of driving scenarios to challenge motor skills such as information popping up on the windshield or having to make a decision between two different options. The simulator takes many factors into account such as the ability to stay in your lane and not weave, the ability to maintain a safe distance from other vehicles, and the ability to maintain a certain speed. So, what has been learned in almost two decades of research? Fillmore’s lab has been interested in how a drug can affect someone’s ability to react quickly to a situation or to suppress a reaction. Alcohol is commonly believed to disinhibit behavior or make an individual more impulsive. The laboratory models examine the degree to which a dose of alcohol can impair someone’s ability to inhibit an inappropriate action. Fillmore has found that under alcohol, individuals are impaired in the ability to suppress actions. While many individuals are exposed to drugs like alcohol, only a few develop an addiction to it, and we need to understand why these individuals develop addiction. The lab also looks at how alcohol can affect generalized impulsivity in other aspects, such as drinking and driving. “We are now learning how alcohol does not just impair driving skills—we’ve known that for decades. Now we are seeing how alcohol can increase an individual’s proclivity to take risks behind the wheel,” Fillmore explained. Looking at DUI offenders and people with repeated DUI offenses, Fillmore has found that these individuals do not report feeling the effects of alcohol as strongly as others and begin to display greater risk-taking when in a driving simulation situation under an acute dose of alcohol. One of the major impacts of this research has been to identify impulsivity and impulse control as an important factor in developing addiction. 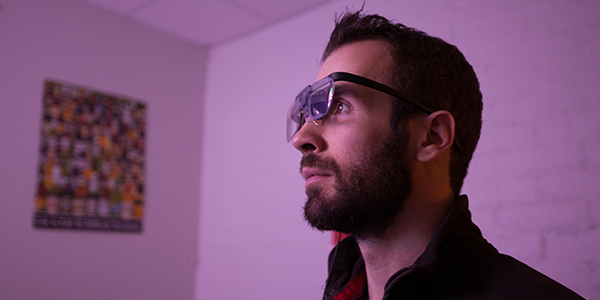 Nick Van Dyke, a 5th year doctoral student in Mark Fillmore's lab, demonstrates new eye tracking technology. Fillmore’s next step includes studying how drugs may produce greater disinhibition and greater cognitive impairments when individuals are taking them in the context of parties and peer groups. He also plans to look at how individuals on social networks begin to use drugs and how their traits influence their peers. As Fillmore’s lab embarks on the next set of questions, they continue to move closer to solving the complex puzzle of addiction.